This recipe is great! 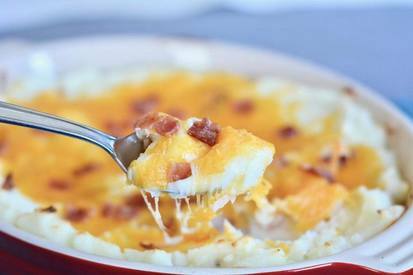 Instead of re-stuffing each individual potato, you add all the ingredients—skins included—to a casserole dish. It’s one less step than the individually baked potatoes but tastes just as delicious. We add Bacon and cheese to our twice-baked potato casserole, and instead of sour cream, I finish it off with ranch dressing because my family loves all things ranch.